There’s not much you can do to expand a small bathroom. You aren’t able to move the tub, sink, or toilet because of where the plumbing lines were installed. For this reason, it’s usually best to make the most of what you’ve got. To help you out, our home remodel contractors created this online guide to show how you can make your small bathroom feel more spacious. For more information, we recommend you consult with experienced Oakland County bathroom remodelers. Sinks with cabinet space underneath are great for storing toiletries and other bathroom items. However, they also take up more space. To free up your floor space, we recommend installing a pedestal sink. If you still have your heart set on a bathroom vanity cabinet, we recommend using one raised off the floor with legs. Your bathroom will seem less cramped when there’s more space to walk around. Did you know that shower curtains can make a small bathroom feel claustrophobic? This is because it cuts off your view of the tub, making the room seem small. Try moving your shower curtain aside to see what we mean. If you notice a significant difference in the perceived amount of space, you may want to consider installing glass shower doors. 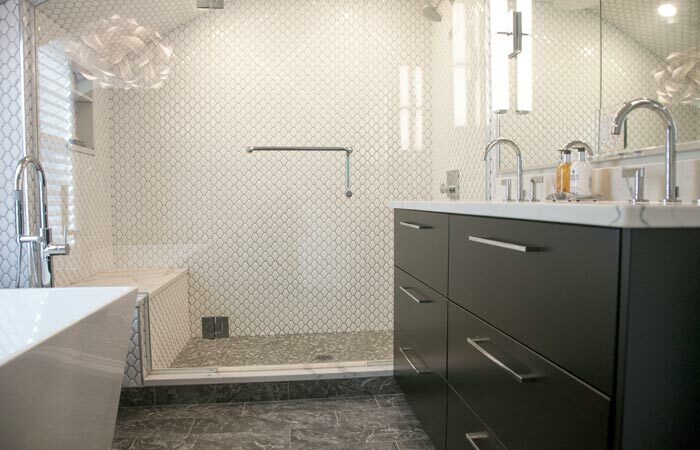 Glass shower doors come in many different designs to complement other design elements, such as bathroom tile flooring. Your bathroom feels smaller when there’s clutter covering up precious counter space. To give your bathroom a makeover, consider investing in wall-mounted or built-in bathroom storage. For example, custom bathroom cabinets can be a great place to store miscellaneous shampoo bottles and rolls of toilet paper. In other words, bathroom cabinets allow you to declutter your bathroom without giving up valuable floor space. You might be surprised by how different your bathroom could look with a fresh coat of paint. For cramped bathrooms, we recommend light neutral shades to give the impression of a spacious airy room. Bathrooms without windows can especially benefit from being painted a light color. If you plan on bathroom cabinet installation in the future, you may want to consider choosing a paint color that complements any wood tones in the room. Nothing makes a room feel smaller than poor lighting. Not only will proper lighting help your room look better, but it will also be more convenient for people to brush their teeth, shave, or put on makeup. Bathroom light fixtures can be installed on either side of a mirror or bathroom vanity. A licensed bathroom remodel contractor will be able to design a bathroom that fits your lifestyle and design preferences. If you are interested in our bathroom remodel services, please feel free to call our Oakland County bathroom design team at (248) 850-7178. 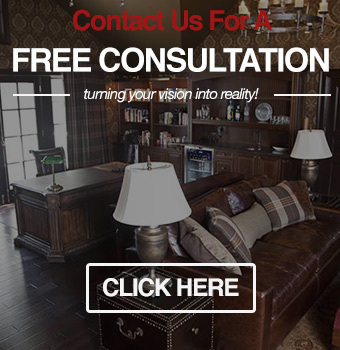 Visionary Cabinetry & Design is a home renovation company dedicated to helping people just like you improve their homes.